I’ve used many of the following efficient eats over the last 9 months since my daughter’s birth, and combined with my morning workouts they have helped me lose almost 60 pounds. Peanut butter! One of my all-time favorite foods. During my recent weight-loss journey I relied heavily on PB with a banana as an instant snack. Almond butter is of course a great option if someone has allergies. Please never buy the PB you see on TV. The big name-brand varieties often have added corn syrup and/or hydrogenated oils. 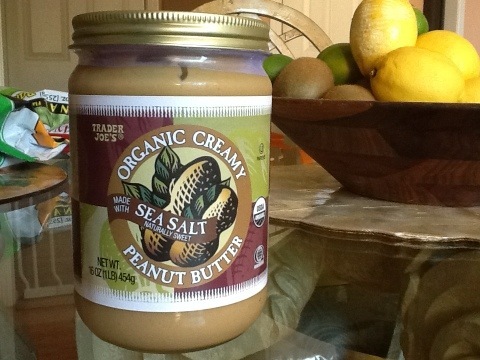 All PB needs to be awesome is nuts and salt. There are now even small PB pouches you can buy to carry with you (I’ve seen several brands at Whole Foods). Throw one of those in your bag with a banana and you’ve got an emergency plan when hunger is driving you toward a vending machine or drive thru! self did soy. Some people have a hard time digesting soy, others milk protein, so choose what works best for you. Many nutritionists feel whey is a better choice and I personally have had better results with it than with soy. I buy vanilla so I can mix it with fruit and milk for a breakfast smoothie or with cocoa powder, milk, and PB for a dessert shake. Ether way they are so highly-filling that I literally can’t eat anything for several hours after having one. 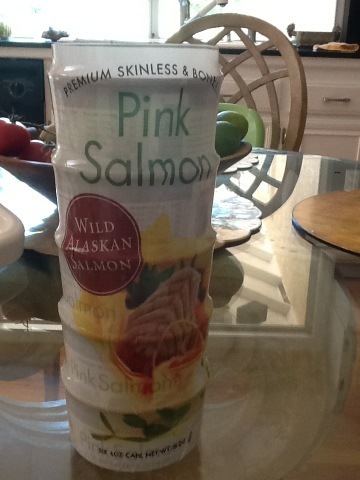 Wild canned salmon. I don’t always eat fish; I didn’t when I was vegan and I didn’t when I was pregnant for fear of toxins. PCBs are my biggest fear with salmon because it’s not a high-mercury fish. But since I’m getting wild salmon that is fished sustainably and I’m not currently pregnant, I feel comfortable eating it. I mix mine with mayo (or veganaise), salt, pepper, and a little garlic powder and eat it like a tuna sandwich on protein bread. Super fast, super filling, and highly nutritious! My toddler loves it too. And since tuna IS a high-mercury fish, it’s a nice replacement for tuna in a child’s diet. Costco sells the brand pictured below for a great price. 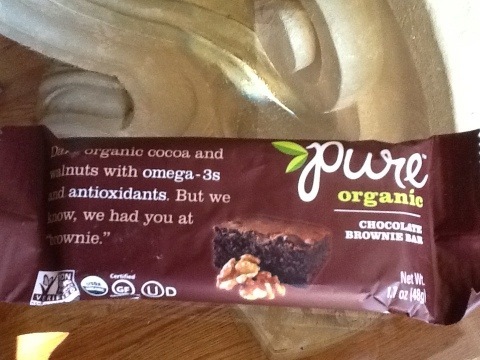 Unsweetened CHOCOLATE almond milk and Pure Organic chocolate brownie protein bars. So if you’ve read my other posts, you probably know that I give up sweets when I want to lose weight. But if you know me personally you also know I LOVE chocolate. A lot. A real lot. So a lot of my go-to snacks have to fulfill that desire. 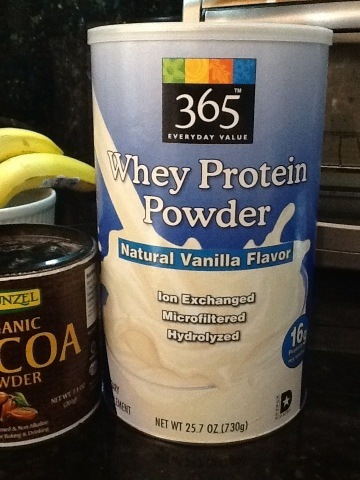 The chocolate PB protein shake does it well, but these other two products are amazing to have on hand too. 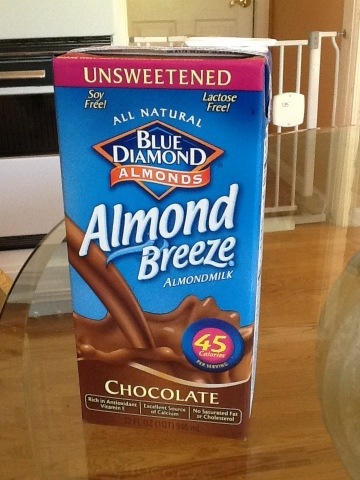 The almond milk has no sweetener whatsoever, so on first sip it will probably throw you. But give it a chance and you might find you no longer miss the sweet. The Pure Organic bars are sweetened only with things like dates and agave and are the only protein bar I’ve seen with only a handful of ingredients, all of which are recognizable as normal foods (no scientific names!). I get both products at Trader Joe’s. Fruits and veggies!!!!!!! As mentioned in previous posts, I think produce is ALWAYS good in large amounts, especially if you’re trying to lose or maintain weight. I snack constantly on berries, kiwis, bananas, grapes, apples, cucumber, melon…and I try to have a big plate of salad with most dinners. Produce can’t be beaten for efficiency; it’s affordable, portable, and often comes in its own wrapper! Nuts! I’ve been snacking on some fantastic roasted salted almonds from Whole Foods. Apple Chips! Costco has these awesome Bare Fruit organic ones that are great for fixing a sweet tooth. *Micronutrients include vitamins and minerals. The three macronutrients are protein, fat, and carbohydrate. Sunflower butter is great too! Suposed be an antioxidant if you can believe that. The taste is like peanut butter cups to me… I bring a jar to work and spread on rice cakes when I don’t have time to pack a lunch. A scoop is also great for a shake with frozen banana and coconut or almond milk! P.S.- LOVE your food blog!